In both the Middle East and Far East, demand for better water and wastewater management is on the rise. In Hong Kong, Hoyer electric motors power large surface aerators, which help bacteria clean the municipal and industrial wastewater. Time is running out for scenes of unfiltered urban wastewater flowing directly into polluted rivers, sewers and canals in cities like Mumbai, Riyadh and Hong Kong. Both governments and corporations in an increasing number of countries are pushing for better wastewater management. One of the companies to benefit from the increased interest in clean water is Hubert B.V. From their factory in the Dutch city Stavoren, Hubert exports water purification and treatment systems worldwide. 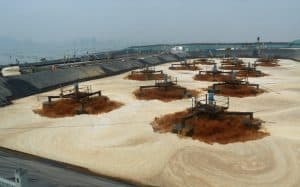 Recently, Hubert installed a series of surface aerators in Hong Kong, where they will help purify the city’s wastewater. The wastewater is cleaned by special bacteria that eat the pollutants, but require oxygen to live. This is provided by the aerators, which use a 1700 mm wide paddle wheel, powered by a high efficiency 22 kW Hoyer motor with matching gearbox to splash the surface of the water, thus mixing it with oxygen. – We specialize in this type of vertical shaft surface aerators. The mixing wheels have a diameter of between 1.7 to 3.5 meters and weigh up to 3000 kilos. It turns at a slow speed of around 50 to 60 revolutions per minute. To achieve this, you need to generate a lot of force, so you often need motors up to 3-400 kW. But you also need to keep the speed down with a reliable gearbox that is up to the task, says Piet Demmer, sales manager for wastewater treatment with Hubert B.V. While the Netherlands have been handling water for hundreds of years and are renowned for their successful water management industry, other nations have only recently made wastewater management a priority. This increased effort to secure clean and clear rivers and lagoons is driving demand for both expertise and high-quality water treatment equipment. 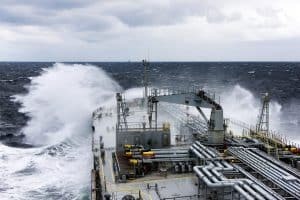 – In the Netherlands, 99 percent of all households are connected to a wastewater plant and there is an overcapacity of water management facilities in case of flooding and extreme weather. But new markets are opening, especially in the Middle East and Far East. In these areas, we are now seeing governments who are willing to invest heavily in wastewater management. Hubert has recently made new contacts in Saudi Arabia and China, says Piet Demmer. While both the know-how and technical solutions of water management companies like Hubert are currently in high demand, the competition is still strong. This makes picking the right suppliers crucial, especially when delivering to new markets. – There is an increasing focus on costs, not just for wastewater projects, but for technical solutions in general. This means that companies needs to be able to deliver high quality products without delays, and keep their costs down at the same time. High delivery performance, good customer support and an extensive stock of motors were some of the key elements we contributed with while working with Hubert on the Hong Kong project, says Key Account Manager Erik Dees from Hoyer Motors. The surface aerators delivered by Hubert B.V. are part of a water treatment facility that processes municipal and industrial wastewater from the city of Hong Kong. So far, Hoyer has delivered 16 22kW V1 electric motors with rain covers. An additional order of 12 pieces is underway. The motors are suited for operation in an outside environment. Supplies a wide range of products, from small screw pumps till complete water intake systems and water treatment equipment. Hubert’s 7.000 m2 factory in Stavoren includes a quay for seagoing vessels, a railway connection and crane capacity of 92.5 tons. This enables Hubert to ship equipment as heavy as 250 tons without difficulties.